with markers, pens, magnetic eraser-pen-holder, wipes, board cleaner-conditioner. 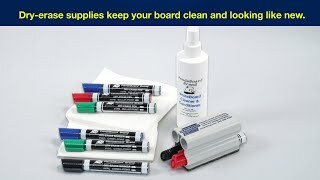 This Write-on Dry-Erase Tool Kit™ includes everything you need to write on, clean and maintain your whiteboard: dry-erase pens in 4 colors with both chisel point broad lines and bullet point fine lines, magnetic eraser/pen holder, Small-Spot™ magnetic eraser plus the materials to keep your whiteboard clean, fresh and like new. To Display documents on magnetic steel whiteboards, See Magnetic ChartJackets®.